"Portland Head Light Postcard "
An image scanned from a postcard of the Portland Head Light. Text on the card notes that this was the first light house erected by the United States of America, the first established beacon light upon the New England coast, lighted for the first time January 10, 1791. The first light keeper was appointed by George Washington. 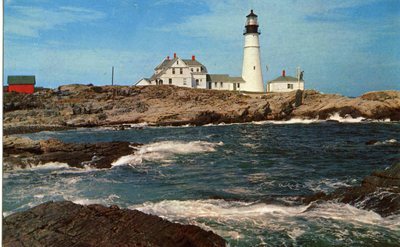 Portland Head, on which the light is situated, gave the name to the city of Portland. Text was added in handwriting on the back of the card to say, "July 22, 1959."